On October 20, 2017, Bill Dobbins (‘74) broke ground on a project that would turn the Peabody building of 400 South Superior Street into a mixed-use space. The ground floor will be commercial spaces, while floors two and three will be loft-style apartments. One of those spaces will be occupied by the Foundry Bakehouse and Deli which is scheduled to be open in August 2018. Dobbins’ company, ACE Investment, bought all of the storefronts from 400 to 416 South Superior Street. He plans to have a few different businesses occupy the storefronts, including a marketing office, a gift shop and a coworking space for entrepreneurs and business owners. Dobbins, who is also the President and CEO of Caster Concepts, Inc., said the name for the Foundry Bakehouse and Deli was inspired by the history of the foundries in Albion. His father worked in foundries, and he felt the name tied together nicely with the bakery and also paid homage to the history of the community. The Foundry Bakehouse and Deli Facebook page recently ran a Google survey to see what community members wanted from the bakery. Dobbins wasn’t surprised by the responses he got — cookies, cakes, pies and bread — but rather the number of surveys taken. According to their Facebook page, the bakery has partnered with Paige Young of EBMY Farms to bring the best offerings to Albion. The Dobbins’ first goal is to get the apartments open first with the bakery shortly following. As for the bakery itself, the Dobbins’ want to invest in the quality of the bakery, first and foremost. Of the six storefronts the Dobbins bought, three are occupied by businesses: H&R Block, Approved Cash and Brick Street Marketing. Dobbins is moving his marketing team from Caster Concepts, Inc. to Brick Street Marketing. Dobbins said that the evolution of Brick Street Marketing will see availability for outside clients and walk-in businesses targeted primarily towards digital marketing, public relations and event publication. In between Brick Street Marketing and Approved Cash will be two different businesses. At the facade will be Pure Albion, a gift shop that offers apparel and merchandise directly related to Albion College and the city of Albion. Dobbins says they will develop their own line of shirts to sell, as well as Albion College logo merchandise, artwork from the community and a variety of other items that directly connect to Albion. Behind Pure Albion will be a coworking space where entrepreneurs can drop in and rent space to work. Renters would get desk space, potentially a storage area, a small conference room, a private room to make phone calls, a kitchenette, networking capabilities, high-quality wireless access and interactive spaces where people starting businesses can gather. Dobbins sees the space being able to accommodate eight to 12 people, and he hopes it will attract entrepreneurs and early business development, somewhat in conjunction with the marketing space. Dobbins also said that apartments above the businesses would be considered, but no plans have been completed. The possibilities for other buildings in downtown Albion are endless. 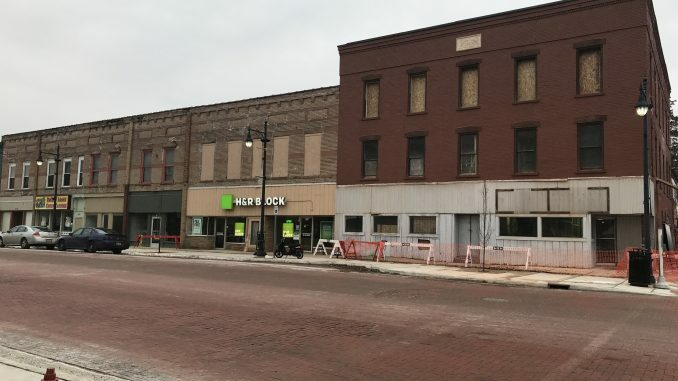 Dobbins is dubbing the 400 section of South Superior Street as “the financial district” because of the businesses along the road which include Homestead Savings Bank, Approved Cash and now Brick Street Marketing. 416 South Superior St is the north section of the Brewery? You have a Food Hub lucky you except no one knows about it ? There is a indoor Farmers Market on Saturdays for the Winter. ( NOW ONGOING ) Ah Yes There is also a Farmers Market during the summer months. Your community needs to support it. It is a proven fact that Market brings in business. Needs to be promoted heavy an published, just like this article. Look at your neighbor Marshall. Good LUCK !